Morigaon (Assam) [India], Apr 5 (ANI): Bharatiya Janata Party president Amit Shah on Friday alleged that Congress leader Tarun Gogoi and All India United Democratic Front (AIUDF) chief Badruddin Ajmal were engaged in what he called “ILU, ILU”, an acronym for “I Love You”. 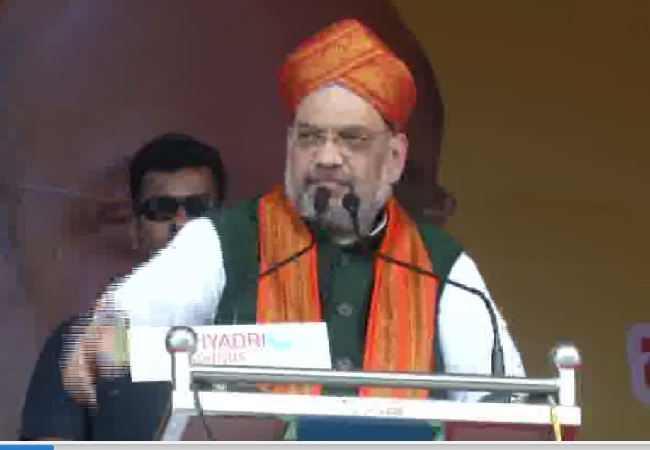 “Gogoi sa'ab and Badruddin Ajmal are engaged in ILU, ILU,” Shah said at an election rally here. There is, however, no formal alliance between the Congress and the AIUDF for the Lok Sabha elections. Shah said that Gogoi, a three-time former Chief Minister of the state, should make his stand clear whether he was with the AIUDF chief or with the country. The BJP chief asked Congress president Rahul Gandhi to clarify his party’s stand on ally National Conference president Omar Abdullah’s remark seeking two premiers in the country, saying that Gandhi lacks the courage to speak on the matter. He hit out at Congress-led UPA for not announcing its prime ministerial candidate. “An alliance which could not decide its leader, can't lead the country,” Shah added. He gave full credit to the BJP for identifying illegal migrants living in the state through the National Register of Citizens (NRC).